In the interest of full disclosure I will tell you that I owned a 1993 Taurus SHO for many years and drove it until it finally gave up after nearly 200,000 miles. I liked that car a lot. It had the Yamaha 220HP V6, front wheel drive and 5-speed manual transmission. 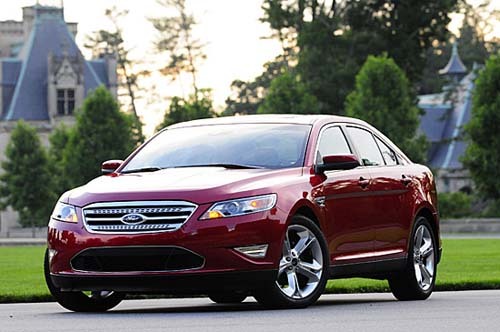 When Ford announced an all-new Taurus, I was pulling hard for an SHO version. Lacking any real pull with the Ford guys, I had mostly resorted to crossing my fingers and wishing real hard. Well, sometimes the magic works. The 2010 Ford SHO brings forth an additional 145 horsepower via a 365HP EcoBoosted turbo 3.5L V6, all-wheel drive, electronically controlled 6-speed transmission, and enough modern technical goodies to truly date my old retired car. Ford has done a great job of revamping their entire lineup. In the next couple of years, there will be no reskinned older vehicles on the showroom floor. The all-new Taurus is a fine representative of this thinking. Differences in outward appearance between a stock and SHO Taurus are minimal. There is tinted glass, chromed dual exhaust, and additional lights along with some discreet badging. Under the skin is where the SHO shines. The aforementioned EcoBoost engine brings twin turbos to bear on the 3.5L V6 to create V8 horsepower with V6 mileage ratings. The slick engine is coupled to a 6-speed automatic transmission. Selectshift controls provide seamless shifting at all levels of driving speed and throttle input. Switching to Manual mode engages the fingertip paddle shifters, allowing for more controlled/spirited driving. When confronted with an exciting road, Manual mode is the way to go. And you don’t need to be a race driver to tell the difference. The new 2010 SHO is as smooth a car as you will find. It’s easy to drive fast or slow and seems comfortable either way. This car is extremely quiet at highway speeds. Your 3 full-sized passengers will also appreciate the roomy interior. The SHO weighs in at 4300 pounds and the brakes will fade quickly if you start hauling around on Track Day. But the four wheel drive system, sport tuned suspension, and ever willing EcoBoost power will give you all the thrills you might expect from a car costing well over the SHO’s $40,000 sticker. One more thing before I go. The 2010 Taurus SHO is a, well, mature car. It’s not a zippy track-anxious Subaru, rock-hard suspended BMW, or mid-sized coupe with big power. Comparisons between the SHO and other cars don’t really apply, though they are certainly out there. Does it really matter if the SHO is 0.2 seconds slower over a quarter mile than Car X? Or that it stops a whopping 12 feet further down the road than Car Y? That kind of thing doesn’t translate into more comfort, more efficiency, or even more fun to drive. And let’s face it, we spend the vast majority of our drive time doing daily driver chores. I get to drive a lot of cars for LACar.com, and the SHO is one I did not want to give back. At 6’2”, I physically fit in the SHO and was very comfortable. Controls are where they should be, everything works as well or better than expected, and on those rare times that I would actually flog the family car, the SHO would not disappoint.